US Bond Markets open for trading at 8:00am EST. US Bond Markets close at 3:00pm EST and the after hours trading session begins. The after hours session ends at 5:00pm EST and US Bond Markets are closed. US Bond Markets open for the overnight session at 8:00pm EST. The overnight session runs until US bond markets open at 8:00am EST. MBS Live's streaming prices will update any time a trade occurs throughout the day, including the overnight trading session. If you select Basis Points, prices are displayed in 0.01 increments. If you select 'Ticks', prices are displayed in 32nds. For some, it can be easier to think of bond market pricing in terms of basis points as this is more readily interchangeable with loan pricing. However, it is a bond market convention for basis points to refer to yields and for 32nds or "ticks" to refer to prices. 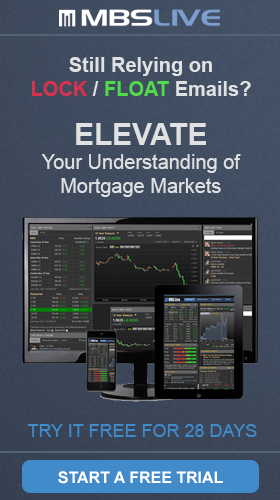 Live, Streaming Intraday Charts are Available with MBS Live! If you are interested in pricing outside of the current month, including 1-Month and 2-Month deliveries, please click below to learn more. MBS and Treasury pricing here is delayed up to 30 minutes. Live Pricing, and much more, are available with an MBS Live subscription. MBS and Treasury data and commentary is provided in partnership with Thomson Reuters and MBS Live. Pricing displayed below is delayed. Real time pricing is available via MBS Live (free trial available). Prices are delayed up to 30 minutes. 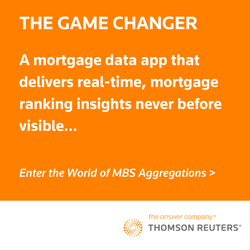 Mortgage News Daily is the exclusive re-distributor of real time Thomson Reuters mortgage data.